Isn't it amazing when a tiny, tangible piece of Box's history is found, often previously ignored, reuniting the present villagers with their past. This happened when Martin Newman showed us a front garden wall on Quarry Hill. There was the lintel which had formerly supported the flat roof of Little Orchard, at one time owned by the Oatley family. It might not sound like a big discovery but it has opened up a lot more of the history of Pleasant View, Quarry Hill and its owners. The house, Pleasant View and the Studio next door were built in 1898 according to the insignia on the top of the building which records CWO 1898, referring to Charles William (Bond) Oatley. However, this appears to be the date of the refurbishment of an earlier property, not the first house on the site. The 1881 census recorded James and his second wife, Rebecca Beer Oatley, living on Quarry Hill with their children Charles William Bond Oatley aged 4, Florence Oatley aged 2 and a baby Eliza E Oatley. By then James was called a retired stone miner, but the family were well-off, employing a general servant, 14-year old Ann Sumbler. Although the house isn't named, it is likely that the property was Pleasant View on Quarry Hill because the road was developed by that time with the Candle Factory at the bottom and Rokeby Villa at the top of the hill. James had been in the quarry trade for many years. His marriage certificate to his first wife, Sarah Poulsom, on 10 July 1837 described him as mason. Both parties were 21 years old but neither James nor Sarah were literate and both signed with their mark. 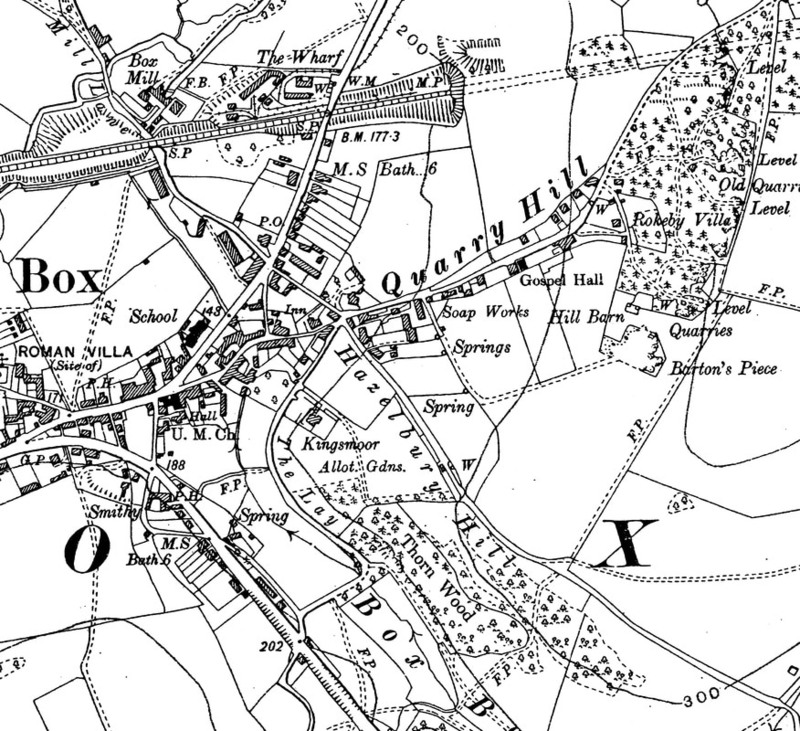 We don't know where James was living at that time, several years before Box Tunnel opened the quarries on Box Hill. By 1851 they were living on Box Hill and James was employed as a quarry labourer. By 1871 the family were living on Quarry Hill and, at the time of Sarah's death in 1875, James was described as a stone quarrier at Quarry Hill. We get more information about his work on his death certificate in 1882 when he was recorded as Quarry Master / Foreman. This management of the quarry probably accounts for his ability to have bought his own property and to employ a servant in 1881. It is probable that James was employed in the quarries at the head of Quarry Hill and the house allowed him to be on hand whenever required. James' will, made in June 1882, a month before his death of abscess of the brain, makes interesting reading. In some respects the will is reminiscent of those centuries earlier because it gifts £10 to three of his children, the family bible to one son and two feather beds to his daughters, a reminder of when possessions were extremely scarce. He listed all his children from both marriages but it was his 5 year-old son, Charles William Bond Oatley, first-born child of his young wife, Rebecca Beer (nee Bond), 24 years his junior, who was to inherit his property on Quarry Hill after Rebecca's death. After James' death, Rebecca continued to live in the house as head of the household. She described herself as widow living on own means. In 1891 her eldest son, Charles William Bond Oatley, was apprenticed to an upholsterer aged 14 and they had a boarder, Edward Keller BSc FAS, tutor, who had been born in Pfullendorf, Baden-Wurttenberg, Germany. Rebecca died in 1909 and her will adds to the story. It states that Charles had borrowed £260 from his mother secured on the property at Quarry Hill. The will doesn't refer to the purpose of the original loan but we might imagine it was for his business purposes or the improvements made to Pleasant View in 1898. CWB Oatley was one of the great characters and businessmen in Box before the Second World War. He was chairman of Box Parish Council, the last chairman of the Board of Guardians of the Chippenham Union Workhouse and Public Assistance Committee, and reported to be a Justice of the Peace for Wiltshire. No Vote, No Tax. The auction sparked two massed meetings of The Women's Tax Resistance League with speakers coming from London and threats of public disorder. 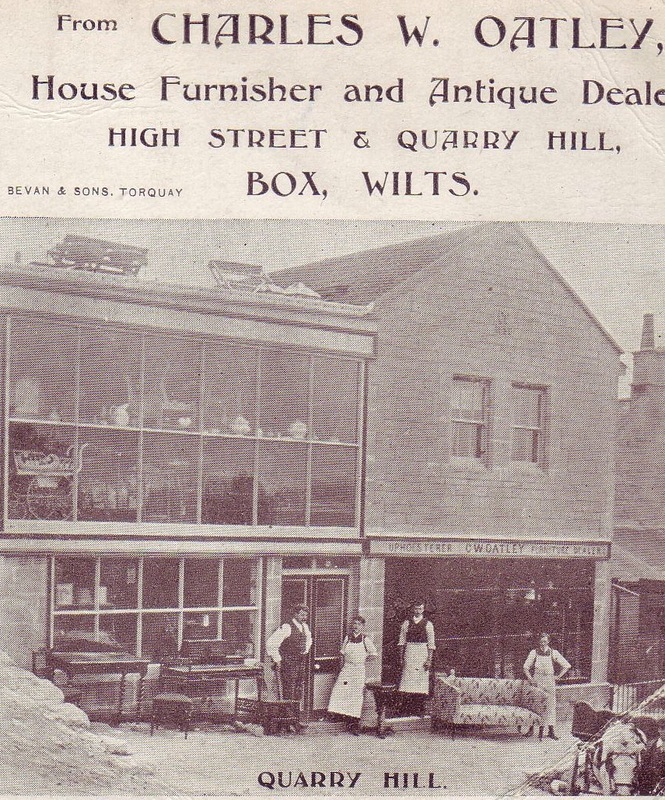 Charles discretely kept his distance and, after this incident, he seems to have concentrated on more normal business matters during the war, selling Mount Vernal Fruit Farm, Box, the upholstery business run from the family home, and his office premises on the High Street, Box (below right). In the depression of the inter-war years, many people needed to sell up and Charles' ability to negotiate and give sound advice was greatly in demand. By 1925 he had spread his business activities between Bath, Box and Corsham. The frontage of the property shows the renovation work when Charles converted it for the needs of his upholstery business. The shop front went across the Studio and the house, both under a lintel that ran the length of the buildings (below left). The shed next to school shown above left has gone but the Studio frontage at Pleasant View and an outbuilding still exists next door to the house, which used to be the upholstery workshop. As might be expected from some of the biblical Christian names given to Oatley children, the family were dissenters in religion. Charles was an active and enthusiastic supporter of Methodism, chairing quarterly meetings of the Bath circuit of the United Methodists and by persistent efforts securing the appointment of a deaconess to take charge of Box Hill and Kingsdown chapels. He was the go-to person for the church, presenting prizes in the United Methodist annual summer fete and sports day in 1927. However, there appears to have been some ambivalence about Charles' adherence to Methodism. In 1933 he awarded the Oatley Cup for the eleventh Box Church of England Schools Sports Day between children designated Highlanders (from Box Hill) and the Lowlanders (Box village). It was a very grand affair: The proceedings commenced with a parade of the competitors who were clad in Oxford and Cambridge colours, the Olympic salute being taken by Mr GJ Kidston, CMG, the donor of the Recreation Field. There is another reason to wonder about Charles' Methodist commitment because he built a chapel in the garden of Mount Pleasant dedicated to the Plymouth Bretheren, to whom he was briefly affiliated. The chapel still exists but has been made into a private residence now called Islove, named after an inscription on the wall of the house referring to the text, He that loveth not knoweth not God; for God is love. It was Charles' work on the parish council that established his reputation for community work. One example of this was the problems of residents at Henley and Longsplatt in 1927 when they complained about being Under Fire from the firing range at Ashley used by the Somerset Territorial Army when a succession of explosive bullets dropped, some of them within a few yards of men working in the harvest field at Henley. One passed close to the face of a resident, another went through a front door. He became something of a local celebrity, invited to the fortieth anniversary dinner of the Bath and Portland Stone Firms Limited in 1928 and presiding over the harvest supper and sale of gifts for the Twerton Methodists. An indication of his importance was his right to a private telephone at Little Orchard in 1933 with the splendid number Box 14. And even his holiday cruise in the Mediterranean and a trip to Pompeii was reported in the local newspaper. Charles began to suffer ill-health in the 1930s. He missed local functions such as a whist drive on behalf of the National Institute of the Blind and was suddenly taken to hospital for a serious operation for appendicitis. Aged over 60, Charles began to reduce the amount of his work and became a public benefactor for Box village. In 1945 he proposed to donate land he owned at Fete Field for the parish council to build a village hall and social centre. It never happened because the field was developed for housing now called Bargates and the idea of a new village hall to replace the Bingham Hall had to wait a further thirty years until the building of the Selwyn Hall. Charles died in 1950, aged 73. He had served for many years on Box Parish Council and worked extremely hard to improve life in the village with the utmost courtesy and good humour. As chairman he called a special meeting of the council to discuss an application they had received to assist a woman who had given birth to quadruplets. When Mr RJ Browning said, We have all had these, Charles asked, What Quads? to which the reply came, No Mr Chairman. I mean these appeal forms. We miss Charles' like in modern Box. James Oatley (1816-12 July 1882) married 1) Sarah Poulsom (1817-1875) and 2) Rebecca Beer Bond (1840-25 February 1909). Moses James (14 April 1858 - 2 December 1893); and Maud Mary (b 1 January 1863). 2) Charles William Bond Oatley (March 1877 - December 1950); Florence (b 1879); Eliza Ellen (December 1880 - 1886). Charles William Bond Oatley (March 1877 - December 1950) married on 17 August 1905 to Hilda Maslen (1885 - 1953).